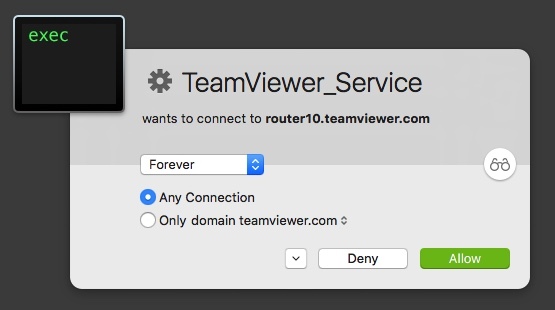 Topic: Why do I keep seeing TeamViewer_Service warnings after allowing any connection forever? Topic: How do I disable these annoying code signature warnings? Re: How do I disable these annoying code signature warnings? These messages do not appear to be related to my Drobo. I removed all of the Drobo software and disconnected the hardware. How do I disable these annoying code signature warnings? Topic: How do I disable the notifcation popups when in silent mode? How do I disable the notifcation popups when in silent mode? Topic: How can I whitelist a range of IPs? How can I whitelist a range of IPs? How can I create a whitelist that includes both individual IP addresses and ranges of IP addresses...and block everyone else? Can I do it like this? Topic: How do I block specific range of inbound UDP ports? Re: How do I block specific range of inbound UDP ports? How do I block specific range of inbound UDP ports?